The Maroondah Symphony Orchestra is a community orchestra founded in 1964 and based in Ringwood, a suburb of Melbourne, Victoria, Australia. Conducted by Willem van der Vis, we present four programs of classical music each year, usually at the George Wood Performing Arts Centre, in Ringwood. New players are welcome, particularly violins and violas.We also need two trumpet(s) for our June performance of Verdi’s Requiem. Players of other instruments are welcome to go on our waiting list. Please see the new players page for details. Online bookings are now available via the link below for our June concert through Eventtixx, George Wood PAC’s new ticketing provider. All ticket purchases now attract a $1 booking fee. Online bookings for each concert close at 8 pm on the night prior to the concert. Although tickets are also available at the door, booking online is simple, allows you to select your seat and avoids the need to queue. Phone bookings can be made on 1300 115 117(Monday-Friday 10am-4pm). 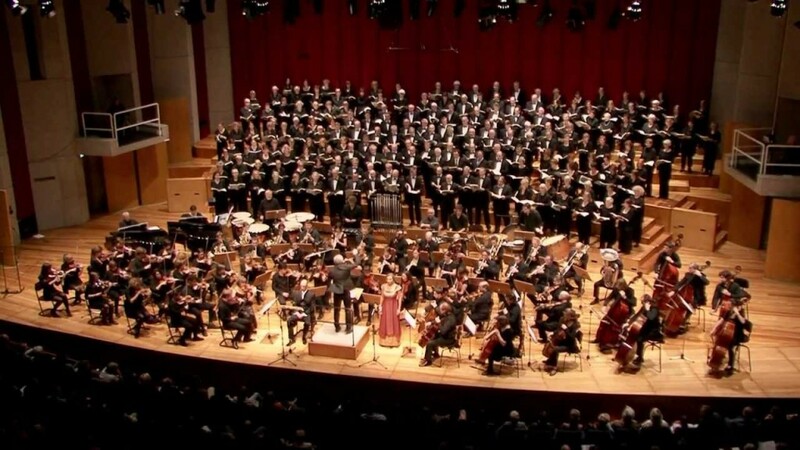 Giuseppe Verdi is best known for his many operas, so it is not surprising that his setting of the Catholic Requiem mass is operatic in scale and drama. Join us for our biennial choral concert featuring a choir of 130, orchestra and four talented soloists. A new commission by the Maroondah Symphony Orchestra by well-known local composer David Keeffe opens this concert. Mozart wrote his last four violin concertos in the same year when he was 19. His sparkling final violin concerto features some vaguely oriental rhythms (actually Hungarian!) in the last movement that gave it its nickname. Brahms’ brooding 4th symphony provides a stark contrast with its sense of yearning for something unattainable. Harry has always been extremely passionate about music and the violin in particular, and is currently training at the Australian National Academy of Music (ANAM) with Robin Wilson. He was most recently studying at Robert McDuffie Center for Strings under the tutelage of Amy Schwartz-Moretti, David Halen and Robert McDuffie in America. Before this time, Harry studied in Vienna, Austria with Professor Boris Kuschnir as part of a course for young ‘Highly Gifted Students’ at the Graz Kunst-Universität, and was afforded the opportunity to consume and perform music with some of the world’s finest musicians. As a violinist, Harry has been fortunate enough to win many prestigious awards and prizes, including the Australian National Youth Concerto Competition, and finalist in the ABC Young Performers Awards. Most importantly, the competitions have afforded some great opportunities to get to know other musicians who have become lifelong friends and mentors. Harry has been invited to attend great festivals, schools and Summer schools. In 2016 and 2017 he attended the Aspen Music Festival under the fellowship program. He successfully auditioned for the prestigious Lac Leman Music Masterclasses in Switzerland in 2014, working with Boris Kuschnir and Mihaela Martin, Daniel Austrich, Nobuko Imai and Frans Helmerson of the Michelangelo String Quartet. In 2011 and 2012 he received full scholarships to the Meadowmount School of Music in New York. He was part of the Rising Stars Program at the Sydney Conservatorium of Music from 12 to 17 years under Professors Peter Zhang and Alice Waten. He has had ongoing mentoring and masterclasses with numerous luminaries such as Professor Boris Kuschnir, Joseph Silverstein (late), Donald Weilerstein, Berent Korfker, Professor Alice Waten, Professor Peter Zhang, Cho-Liang Lin, Walter Schwede, Charmian Gadd, Patricia McCarty, Gerard Willems and James Ehnes whom he worked with in Vienna and America. Since the age of ten Harry has frequently been asked to perform as a soloist, concertmaster and chamber musician; with performances in Australia, America, China, Mexico, Singapore and Europe. He has performed as soloist with the Nanjing, Nanning, Hunan, Hangzhou, Xiamen, Willoughby, Beecroft, Ku-ring-gai, and The Arts Unit Symphony Orchestras, and the Orquesta Sinfónica de Michoacán in Mexico. Harry has collaborated with many different conductors such as Fu Renchang of the Berlin Symphonie, Eduardo Sanchez-Zuber, Manuel Alberto and Ward Stare. From 2009-2013, Harry lead the Porcelian Quartet and many other chamber groups in various music festivals around the world. Harry performs on a beautiful 1780 Pietro Antonio Landolfi violin on loan from anonymous but very generous benefactors. After the sun rises with Carl Nielsen’s evocative Helios overture, talented young pianist Meng Xia will dazzle us with Liszt’s second piano concerto. Full of drama and alternately wistful and exciting, this will be followed by Litolff’s famous Scherzo, a favourite of virtuoso pianists and audiences alike. The concert concludes with Dvořák’s bucolic and tuneful 8th symphony. Meng began playing the piano at the age of six and currently studies at the Victorian College of the Arts Secondary School with maestro Glenn Riddle. Meng enjoys playing chamber music with his peers at VCASS and singing in the choir. He has also won numerous awards including the Ann and Chris Krans Music Award, the Margaret Green Scholarship at ‘Eisteddfod by the Bay’ as well as the Reg and Lil Lewis Romantic Era Award. Meng has been gaining experience by performing and in competitions. He most recently competed overseas in Kuala Lumpur. Meng intends to continue his music studies at university and aspires to become a concert pianist.